Fukuoka (, Fukuoka-shi) is the capital city of Fukuoka Prefecture and is situated on the northern shore of the island of Kyushu in Japan. Ranked 12th of the worlds most livable cities in the global affairs and lifestyle magazine Monocle in 2013, Fukuoka was praised for its green spaces in a metropolitan setting. It is the most populous city in Kyushu, followed by Kitakyushu. It is the largest city and metropolitan area west of Keihanshin. The city was designated on April 1, 1972, by government ordinance. Greater Fukuoka (), with 2.5 million people (2005 census), is part of the heavily industrialized Fukuoka–Kitakyushu zone as well as Northern Kyushu. As of July 2011, Fukuoka is Japans 6th largest city, having passed the population of Kyoto. This marks the first time that a city west of the Kinki region has a larger population than Kyoto since the founding of Kyoto in 794. In ancient times, however, the area near Fukuoka, the Chikushi region, was thought by some historians to have possibly been even more influential than the Yamato region. Exchanges from the continent and the Northern Kyushu area date as far back as Old Stone Age. It has been thought that waves of immigrants or even royalty first arrived in Northern Kyushu from mainland Asia. Several Kofun exist. Fukuoka was sometimes called the Port of Dazaifu (?? ?, 15 km (9 mi) southeast from Fukuoka). Dazaifu was an administrative capital in 663 A.D., but a historian proposed that a prehistoric capital was in the area. Ancient texts, such as the Kojiki, Kanyen (found in Dazaifu) and archaeology confirm this was a very critical place in the founding of Japan. Some scholars claim that it was the first place outsiders and the Imperial Family set foot, but like many early Japan origin theories, it remains contested. 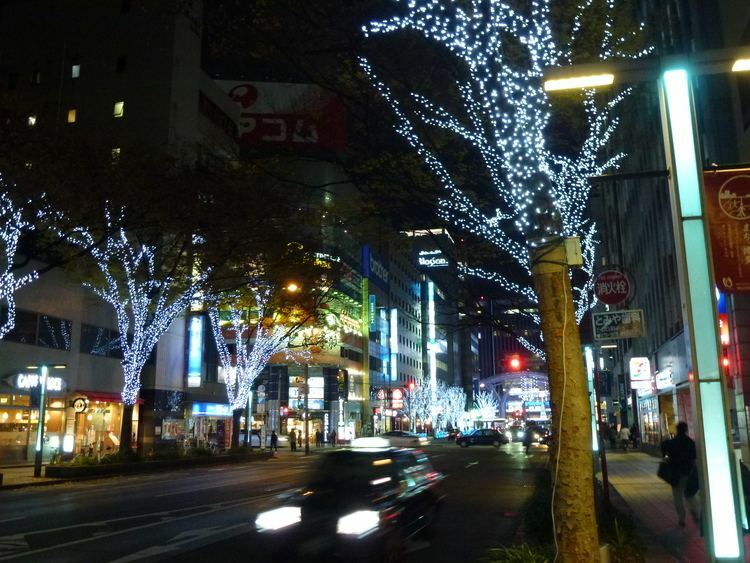 Fukuoka is sometimes still referred to as Hakata, the central ward of the city. In 923, the Hakozaki-g? in Fukuoka was transferred from Daibu-g? in Daibu (? 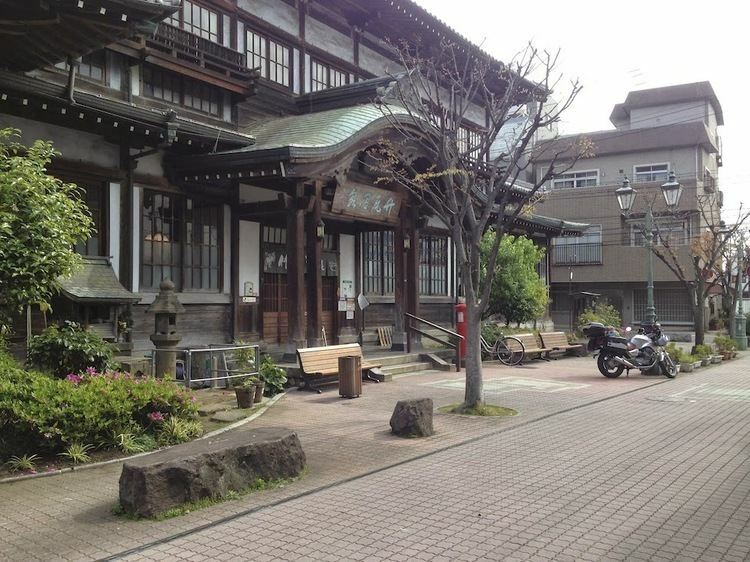 ?, 16 km (10 mi) northeast from Dazaifu) the origin of Usa Shrine and established as a branch of the Usa Shrine at Fukuoka. In Ooho (? ?, 15 km (9 mi) south from Dazaifu), there are remains of a big ward office with a temple, because in ancient East Asia, an emperor must have three great ministries (? ?, ?? and ??). In fact, there is a record in Chinese literature that a king of Japan sent a letter in 478 to ask the Chinese emperors approval for employing three ministries. In addition, remains of the Korokan (?? ?, Government Guest House) were found in Fukuoka underneath a part of the ruins of Fukuoka Castle. Fukuoka is the economic center of the Kyushu region, with an economy largely focused on the service sector. Large companies headquartered in the city include Iwataya and Kyushu Electric Power. Fukuoka is also the home of many small firms playing a supportive role in the logistics, IT and high-tech manufacturing sectors. Most of the regions heavy manufacturing takes place in the nearby city of Kitakyushu. Fukuoka was selected as one of Newsweeks 10 "Most Dynamic Cities" in its July 2006 issue. It was chosen for its central Asian location, increasing tourism and trade, and a large increase in volume at its sea and airport. Fukuoka has a diverse culture and a wide range of cultural attractions. In its July/August 2008 issue, Monocle selected Fukuoka as number 17 of the "Top 25 liveable cities". It was chosen for excellent shopping, outstanding food, good transport links, good museums, "a feeling of openness in its sea air", green spaces and because its friendly, safe, clean and close to the rest of East Asia. Fukuoka City Museum – displays a broad range of items from the regions history, including a spectacular gold seal. Genko Historical Museum (, Museum of the Mongol Invasion) – In Higashi Koen (East Park); displays Japanese and Mongolian arms and armor from the 13th century as well as paintings on historical subjects. Open on weekends. 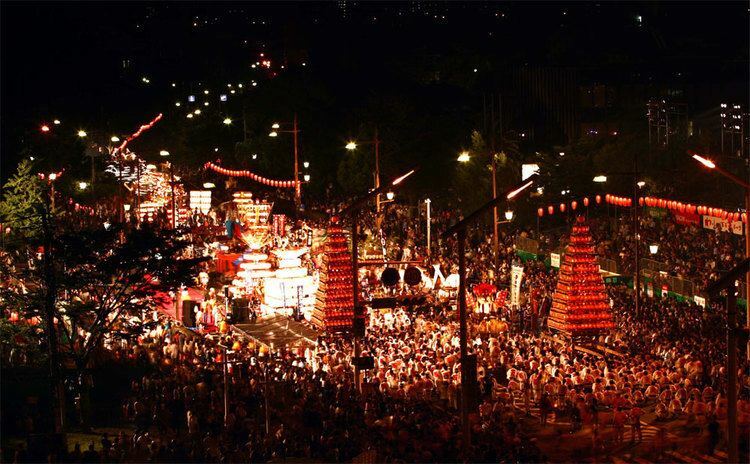 Yamakasa (), held for two weeks each July, is Fukuokas oldest festival with a history of over 700 years. The festival dates back to 1241 when a priest called Shioichu Kokushi saved Hakata from a terrible plague by being carried around the city on a movable shrine and throwing water. Teams of men (no women, except small girls, are allowed), representing different districts in the city, commemorate the priests route by racing against the clock around a set course carrying on their shoulders floats weighing several thousand pounds. Participants all wear shimekomi (called fundoshi in other parts of Japan), which are traditional loincloths. Each day of the two-week festival period is marked by special events and practice runs, culminating in the official race that takes place the last morning before dawn. Tens of thousands line the streets to cheer on the teams. During the festival period, men can be seen walking around many parts of Fukuoka in long happi coats bearing the distinctive mark of their team affiliation and traditional geta sandals. The costumes are worn with pride and are considered appropriate wear for even formal occasions, such as weddings and cocktail parties, during the festival period. Hakata Dontaku () is held in Fukuoka City on May 3 and 4. 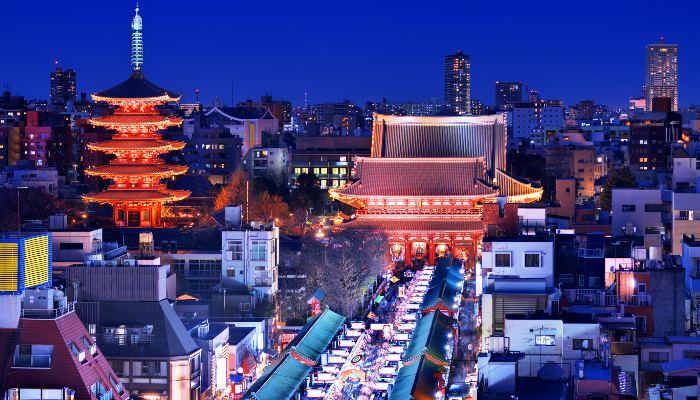 Boasting over 800 years of history, Dontaku is attended by more than 2 million people, making it the Japanese festival with the highest attendance during Japans Golden Week holidays. During the festival, stages are erected throughout downtown for traditional performances and a parade of floats is held. The full name is Hakata Dontaku Minato Matsuri. The festival was stopped for seven years during the Meiji era, and since it was restarted in the 12th year of the Meiji era it has been known as Hakata Dontaku.